Lap records tumbled as the latest Manawatu & TRC Toyota WPKA Goldstar KartSport Series got off to a cracking start in Taranaki over the weekend. 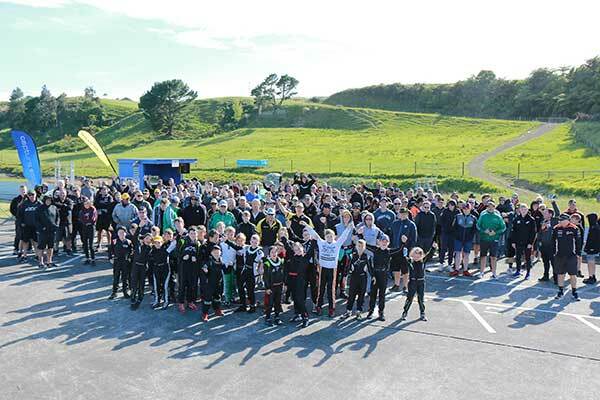 No fewer than six previous class benchmarks were smashed as over 100 drivers battled it out in perfect racing conditions at host club, KartSport Taranaki’s Todd Energy Raceway on Sunday. 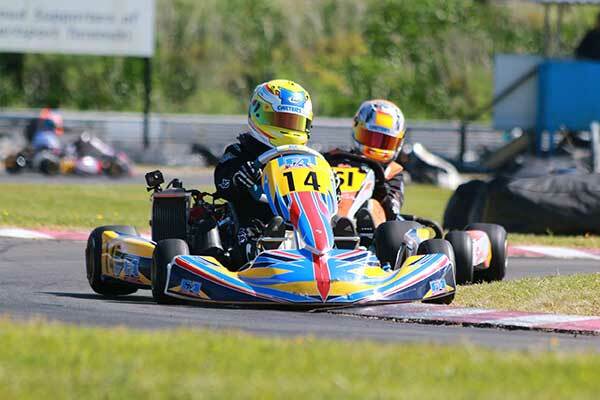 Leading the way was Palmerston North’s Jacob Cranston, fresh back from representing New Zealand at the annual Rotax Max Challenge Grand Final meeting in Portugal the weekend before. Cranston was again the dominant figure in the Open class, claiming round honours with three heat wins and a second place, and lowering the class lap record to 26.026 on his way to winning the standalone Senior Grand Prix race. Former Junior class standout Ashton Grant also lowered the 125cc Rotax Light class lap record in that race, leaving it at 27.544 on his way to a debut class win in a Senior GP race. The Junior Rotax class also saw a shake-up as Hamilton brothers Fynn and Clay Osborne make their presence felt. Consistency saw Fynn claim round honours over reigning class South Island champ William Exton from Picton and brother Clay, while speed saw Fynn take both the win and new class lap record (27.394) in the Junior Rotax GP with Clay second and top Palmerston North driver Jackson Rooney third. The other class lap records fell in the heats. Blake Dowdall – who went on to finish third behind Kiahn Burt and Hugo Neale in the round standings – lowered the Cadet ROK class mark to 31.407 in the fifth heat, while class round winner Tom Bewley left the Vortex Mini ROK record at 30.373 in his fourth heat. Finally, class round and GP winner Derek Lawrence completed a personal trifecta in the second ClubSport 120 heat, lowering the record to 31.423. A highlight for many at the track was the racing in the combined ClubSport 120 (2-stroke)/Briggs LO206 (4-stroke) races. While the 2-stroke ClubSport 120 karts were ultimately quicker the request – from the drivers in both categories – to run them together produced some of the closest and most tactical racing on the day. KartSport Wellington clubmates Hadleigh Coffey and Brent Melhop were the best of the Briggs LO206 brigade, finishing first equal tying on points and Melhop the best of the Briggs’ finishers in the combined GP race, crossing the finish line in an impressive sixth place overall. Michael McCulloch from the Kapiti Coast was the other big winner on the day, claiming class round honours in the combined 125cc Rotax Max Light/Heavy class over Zach Zaloum and Campbell Jamieson. Fourth on her local Senior class Goldstar series debut was top female driver Rianna O’Meara-Hunt from fellow former Junior class standout (and new class track lap record holder) Ashton Grant. Ashley Higgins was first Heavy category finisher. And O’Meara-Hunt, who was one of a small number of drivers contesting two classes, also finished fourth in Open. 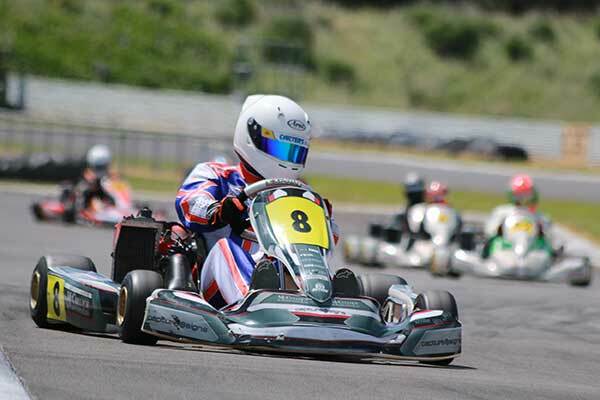 Several other drivers stepped up a class at Taranaki, including former Cadet ROK champ Louis Sharp who scored a debut win in the Vortex Mini ROK GP race and finished fifth in class for the round behind Tom Bewley, Hayden Bakkerus, Logan Manson and Mason Potter. 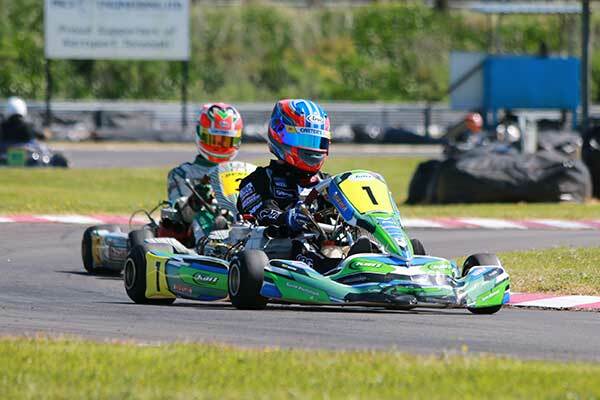 With Palmerston North-based Gary Douglas Engineers’ support there are now three trips to a premium karting event in Australia with the use of a Tony Kart and Vortex engine up for grabs, two in the Vortex Mini ROK class, and one for Cadet ROK. Supreme Kart Supplies and Engines has also put up a Tony Kart chassis as a prize incentive for drivers across the Senior classes who compete at all four rounds. Other incentives include a free entry to the annual SpeedSport motorsport scholarship programme, plus a test weekend with top Formula First team Sabre Motorsport at Manfeild for the winner of the Junior Rotax class. There will be trophies down to sixth place in each Junior class and third place in each Senior one plus for the first Masters category competitor home in each relevant class at each round. Other prizes include six Stilo helmets supplied by NZ importer Neil Allport Motorsport, sets of tyres supplied by NZ Dunlop kart tyre importer and distributor Lascom Motorsport, and various other merchandise to be distributed at each round.